A new class of worker is beginning to emerge and supersede the knowledge worker. This group is distinguished not only by their ability to think with reason, but also with creativity, intuition, and emotional intelligence. In short, they possess … wisdom, in a word, as the most esteemed human quality. Are we there yet? Has this new class of worker rushed in to fill the need for wisdom? How about you – are you operating day in and day out at the level of wisdom worker? When any new form comes into the foreground of things, we naturally look at it through the old stereos. We can’t help that. This is normal … We’re just trying to fit the old things into the new form, instead of asking what is the new form going to do to all the assumptions we had before. The point is that today, decades into the internet revolution, many of us marketers still struggle to get out of the “old stereos” or perceptions of how to evolve our business strategies. While we have access to technology that enables potentially new ways for us to produce and distribute content, to disrupt old forms of advertising, to deliver new kinds of customer experiences, and to differentiate our brands in expanded marketplaces, many of us have not fully engaged with the question of how these new opportunities could transform what we do. Most of us have not made the transition from knowledge worker to wisdom worker. 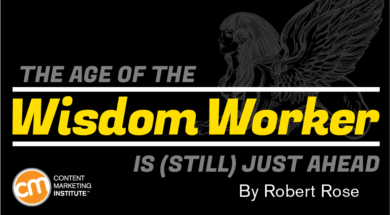 Why do I say most of us are not operating at the level of wisdom worker? Look at the content around you. The internet revolution has been realized at the expense of content’s value. Because of the ever-increasing ease with which content can be produced and distributed, businesses have viewed content as yet one more widget that can be made more efficient when measured by output. In other words, many businesspeople (unwise workers?) see technology as a means of commoditizing content. A 2017 study from the American Marketing Association concludes that marketers have less confidence now than they used to have in their ability to be customer-centric, to measure things, and to put the right team and operating model in place. At the same time, by and large they’re “extremely confident” in technology, envisioning that it will solve these challenges. Spoiler alert: It won’t. Technology is not wise. If we are to evolve our businesses, we marketers and content practitioners must drive the strategy that creates the future, pulling the technology along with us with creativity, intuition, emotional intelligence. Wisdom. The interviewers asked me how many pieces of content I could create for their marketing teams. They wanted to know how many white papers, articles, social posts, and other elements of content I could produce on a monthly basis. I told them that we would need to develop a strategy to determine the kind and amount of content we should be creating. The interviewing team said, ‘We don’t have time for that.’ All they wanted to know was how much I could create. I told them that I couldn’t tell them that until I understood or created the strategy. I didn’t get the job. In many businesses, thoughtful strategy is neglected in favor of mechanical execution. While businesses may be hedging their bets by investing in content technology, they are doing it at a fever pitch, chasing efficiency alone, without realizing they are simply mining sand. If content is to be gold, businesses must invest in new alchemists. Wisdom workers. Wisdom. The power of discernment. The ability to create meaning from information. The ability to tell stories. The ability to synthesize new solutions. Those are things that require strategic thinking. Those are things companies must hire for if they want to innovate and thrive. To be clear, this doesn’t mean we should all become generalists, jacks and jills of all trades and masters of none. Rather, we need to bring a combination of strengths and talents to invent new experiences for customers. Instead of bemoaning the absence of tools, education, budget, and resources we wish we had, we need to ask ourselves, if we had everything we could ask for to do our jobs, what kinds of customer experiences would we create with our content – experiences that no one has dreamed? That’s the opportunity awaiting the wisdom workers. It’s just up ahead, around the corner. Will you step up to greet it? Hear from Robert as he hosts a pre-conference workshop on Sept. 5 before the main conference at Content Marketing World. He’ll be talking about how to reboot your content marketing to build a scaleable marketing strategy. Register today and save $100 using code BLOG100. The ICC 2018 call for speakers is now open! We’re looking for seasoned professionals who are not only experienced in the field of intelligent content, but who are also top-notch storytellers and speakers. If this is you, we want to hear from you.